Patrick and I are on a healthy eating kick, so I’ve been trying to put together a couple of tasty dishes on Sundays that we can eat throughout the week. Spinach has been a popular, repeat ingredient. Last weekend I made a spinach pie, which was tasty, but was nowhere near as good as the spinach dish Arava Talve made for Passover that I was trying to emulate. Alas, it won’t make the blog. 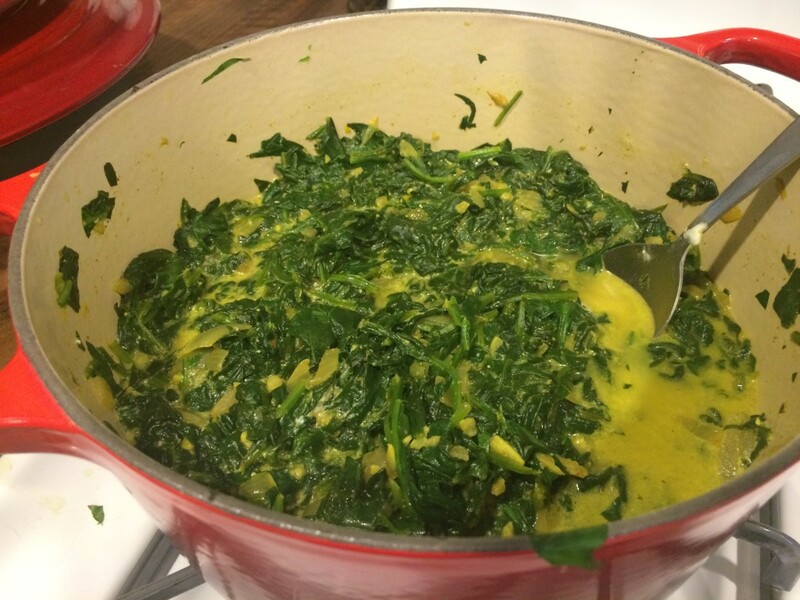 This week, Indian food sounded good, so I made Spinach Saag, a flavorful dish of chopped spinach. It’s usually made with chunks of paneer, an Indian cheese, but I made mine simple and filled it out with some plain yogurt. Here’s the recipe! A tip: I’m not usually one to cut up and measure out all of my ingredients beforehand. I usually chop as I go. But with this recipe, and the short amounts of time the various ingredients end up in the pan, it made more sense to prep everything except the spinach before I turned on the heat. 1. Melt one tablespoon butter in a heavy pot (I used my Le Creuset). Add the onion and cook until softened over medium-high heat, about 7 minutes. 2. Add another half tablespoon butter and the garlic. Cook until the garlic softens and becomes fragrant, another 3-5 minutes. 3. Add the rest of the butter, the minced ginger and the spices. Stir into a paste and allow the flavors to meld and the ginger to cook, about 3 minutes. 4. Working on batches, add handfuls of the chopped spinach to the pot and allow it to wilt. I did this by adding a few handfuls, putting on the lid, waiting a couple of minutes, then adding a couple more handfuls and stirring the cooked stuff to the top. 5. 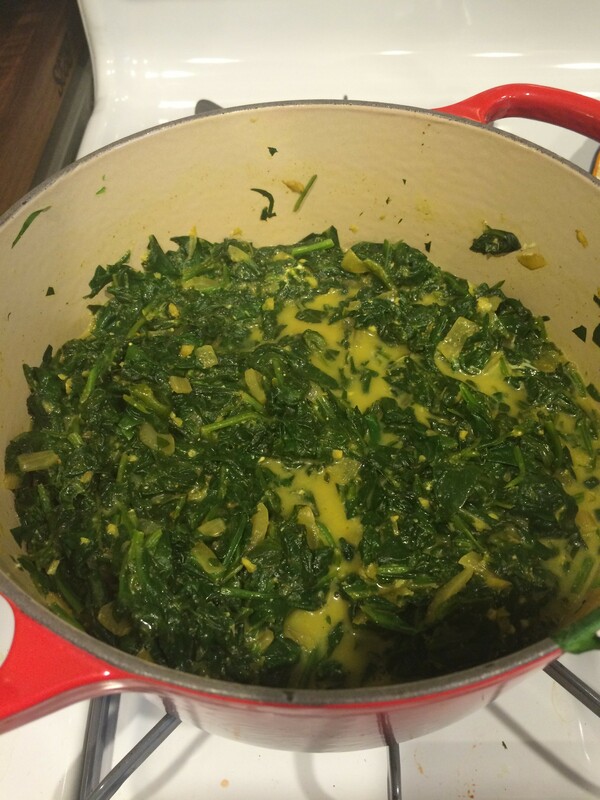 Once all the spinach is cooked, uncover and cook another 5 minutes to let all the flavors meld. 6. Remove from the heat. Mix in the yogurt and salt. Enjoy today or let it sit overnight and allow the flavors to marinate! This entry was posted in Sides and tagged Asian foods, Spinach, Vegetarian. Bookmark the permalink.